Regular readers know that I am much more concerned about seeing new venues than games. 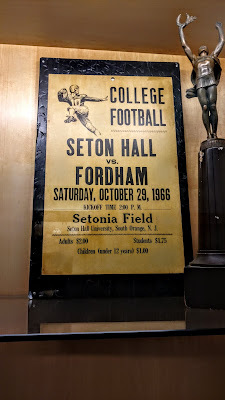 Having visited pretty much every meaningful stadium in the New York area, it is tough to find something that excites me. 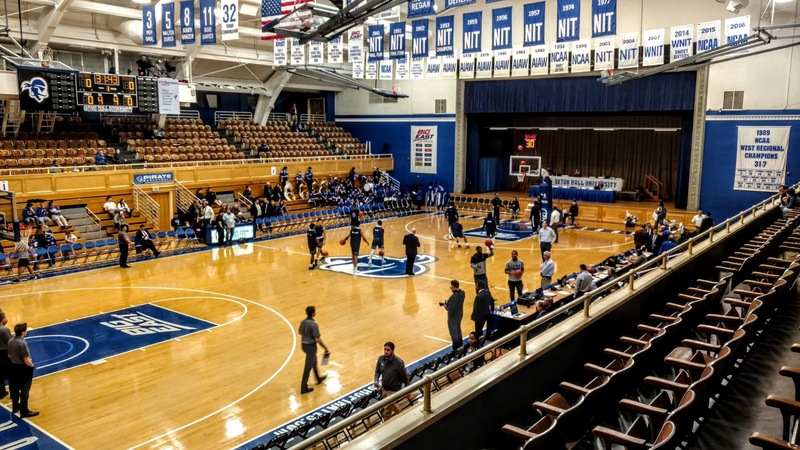 The renovated Nassau Coliseum recently reopened and I'll have to head out there for a Long Island Nets game sometime, and NJIT has a new basketball court that I will check out this season, but these are not particularly compelling venues. 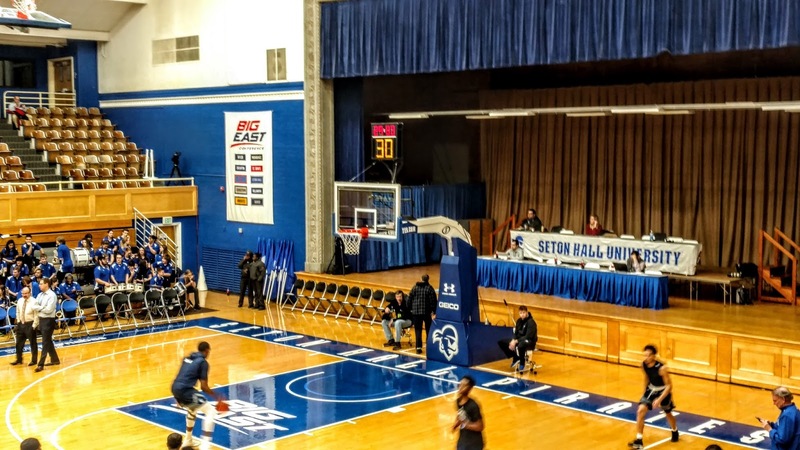 But as I scoured the schedules for December, I was surprised to see that Seton Hall would be playing a rare game at their campus court, Walsh Gymnasium. I saw the Pirates play at their regular home, the Prudential Center, back in 2013 on a visit to NYC, but had never even heard of Walsh until I saw this game on the calendar. 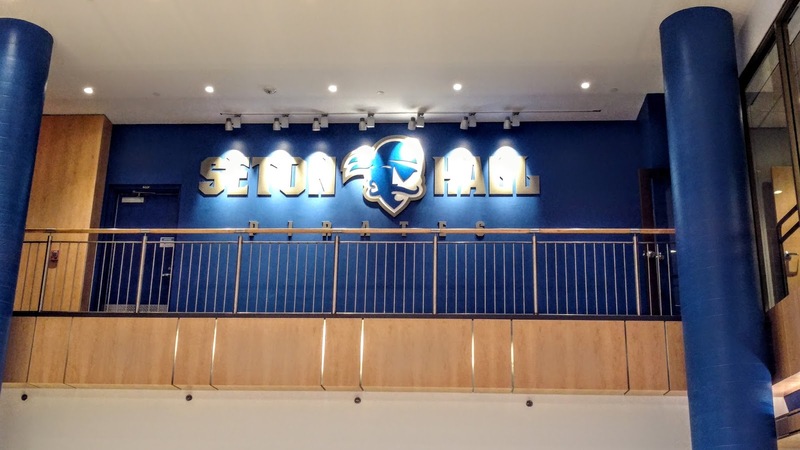 Tickets were available via the Seton Hall Box Office, so I phoned up and was happy to find them still available. At $40, it was not cheap, but as this was the only chance I could see the venue, I splurged. 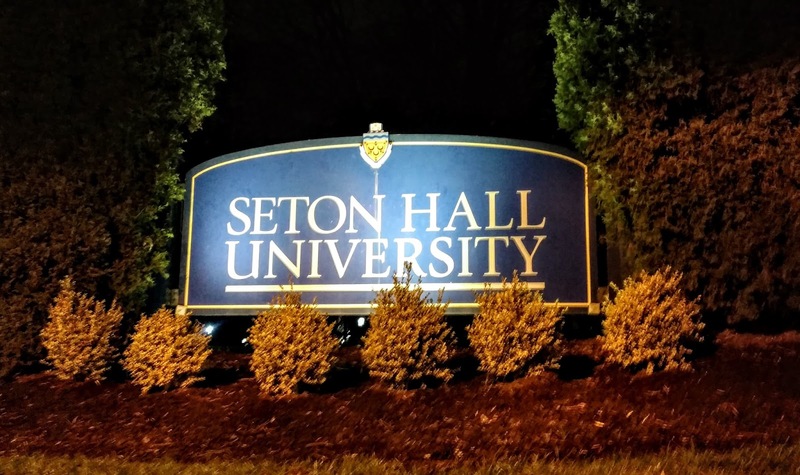 After work on Tuesday, I grabbed a NJ Transit train to South Orange and then walked the mile or so to the gym. The McNulty Pedestrian entrance on South Orange Avenue is locked 24/7, a fact of which I was not aware until I arrived. Fortunately, someone was leaving and I was able to enter that way; better to use the Ward Place gate both coming and going. The gym is located next to the Richie Regan Recreation and Athletic Center at the southeast corner of campus. 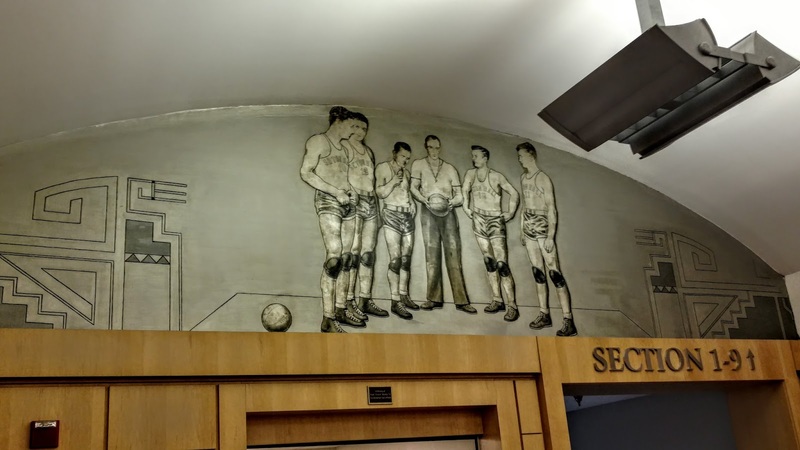 It was built in 1941 and still stands separately, but there is a single entrance that leads to a lobby that serves both facilities. 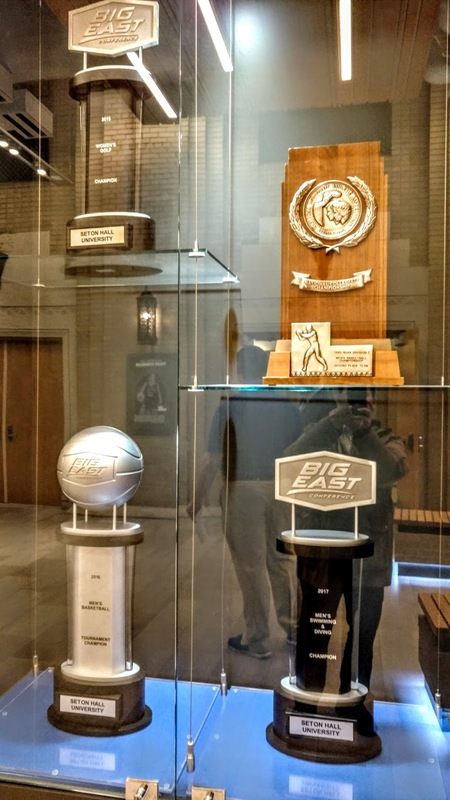 Go up a small set of stairs on the left to reach the historical displays that mark the entrance to Walsh. 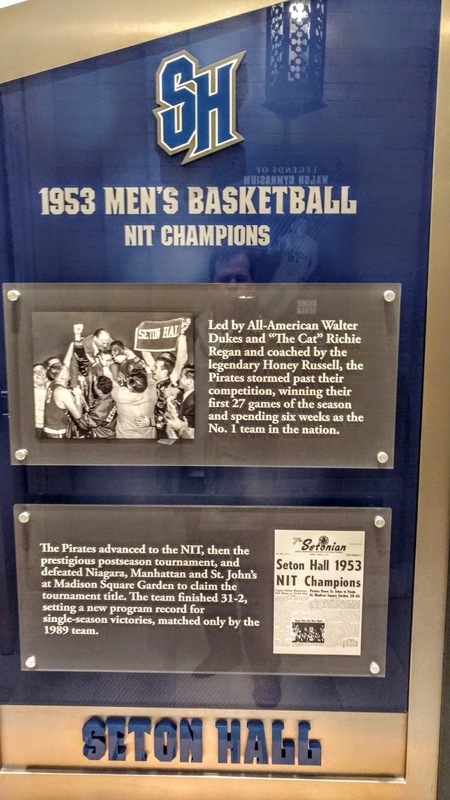 Seton Hall athletics has a long and storied history, mostly in basketball but also in other sports. That's baseball Hall-of-Famer Craig Biggio in the center above; he played here during the mid-1980s along with Mo Vaughn and John Valentin. Note the interactive television screens along the bottom; something you only see in newer big league venues. Very impressive! 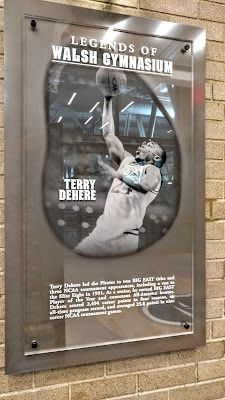 Basketball has had its share of stars as well, with all-time leading scorer Terry Dehere, who finished his NBA career with the Vancouver Grizzlies in 1999, noted prominently. 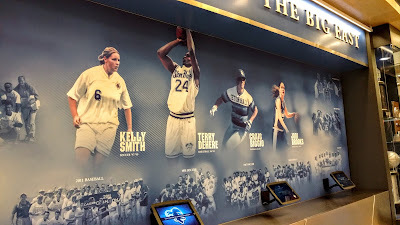 The basketball team had one remarkable run to the NCAA tournament final in 1989, losing to Michigan in overtime. 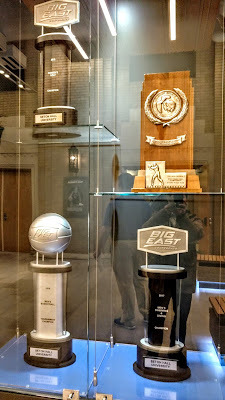 That trophy is on the top right above; the others are more recent Big East titles in women's golf, men's hoops, and men's swimming and diving. 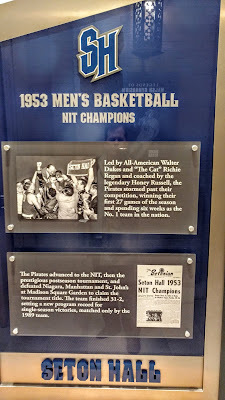 The team did win the 1953 NIT with a 31-2 record, back when it was considered the preeminent postseason tournament, but they were not the national champions. 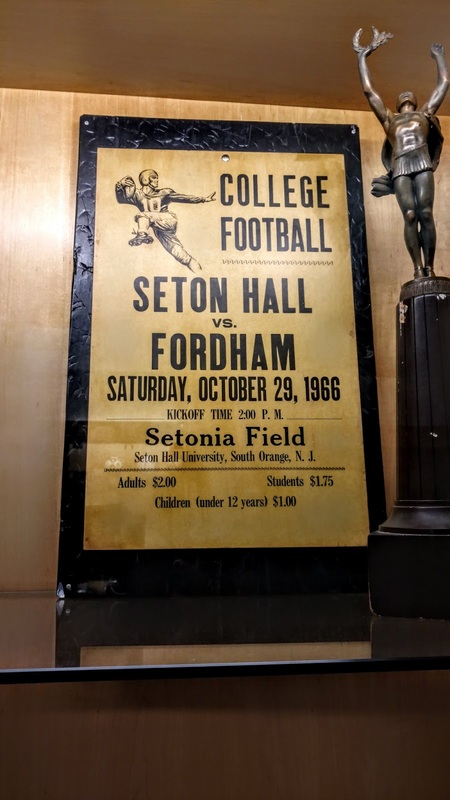 I particularly enjoyed the poster from a football game in 1966, when I was two months old. In the NHL that day, the Leafs and Bruins tied at 3 while the Habs shutout the Rangers 3-0. There are several other historical touches, such as the scoring wheel that looks like an old LP above. 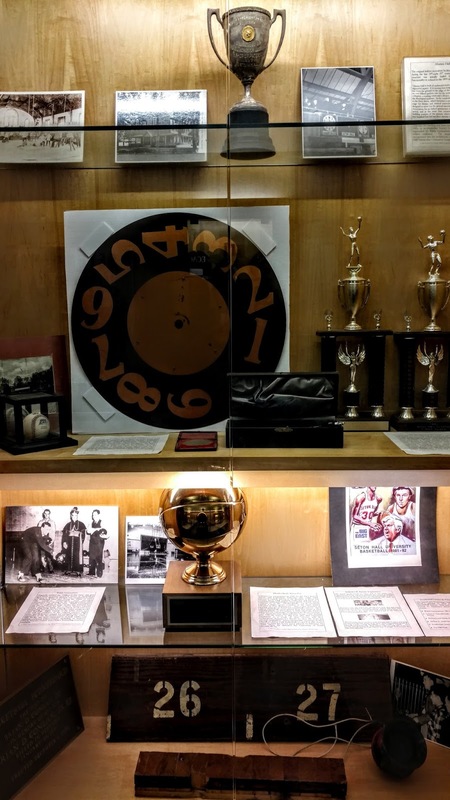 Although the men's team plays here only once or twice per season, women's hoops and volleyball use the gym exclusively and it is worth a visit to either of those to see everything that is on display. There are two small concessions stands in the lobby by the downstairs entrances with limited offerings at cheap prices. Above each are black and white murals that probably escape the attention of most fans, but are worth noting, as I am sure these are original to the building's construction. As you can see above, there are two levels of seating. 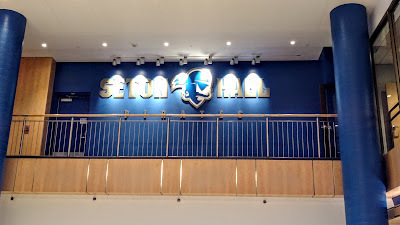 The lower level is accessed through entrances next to the historical displays, and seemed reserved for students mostly, while you have to walk up a set of staircases to reach the balcony. 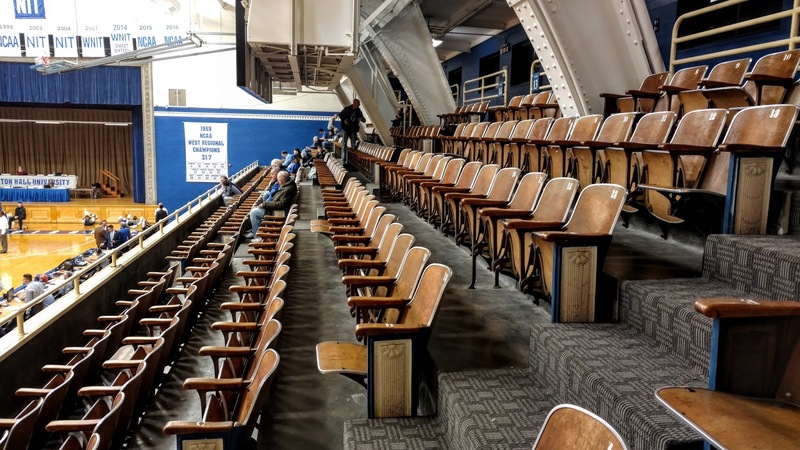 Here you will find 7 rows of old wooden seats that might also date from the buildings construction. 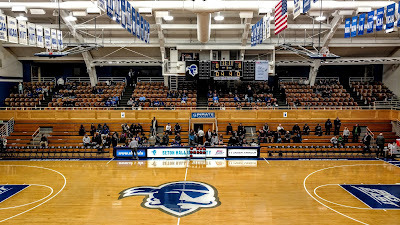 Capacity is only 1,655, which explains why the team plays mostly in Newark. 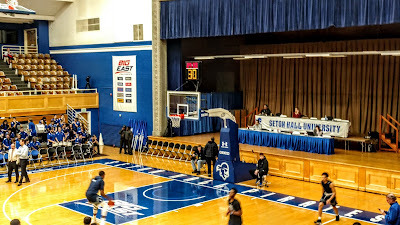 When I bought my ticket, I didn't bother to ask for a specific location and was given a seat in the section farthest to the left, which wasn't ideal (below). The walkway above the seats is open for standing, though the pillars that hold up the press box and camera positions block some of the court from certain spots, but I found an open space and stayed there for the entire game (below). At the left of the photo above you see a large glass enclosure that is the equivalent of suites from what I can tell, while the far right is a stage, as Walsh is used for other functions, including graduations. I was really happy to get to see a game here as chances are so few. 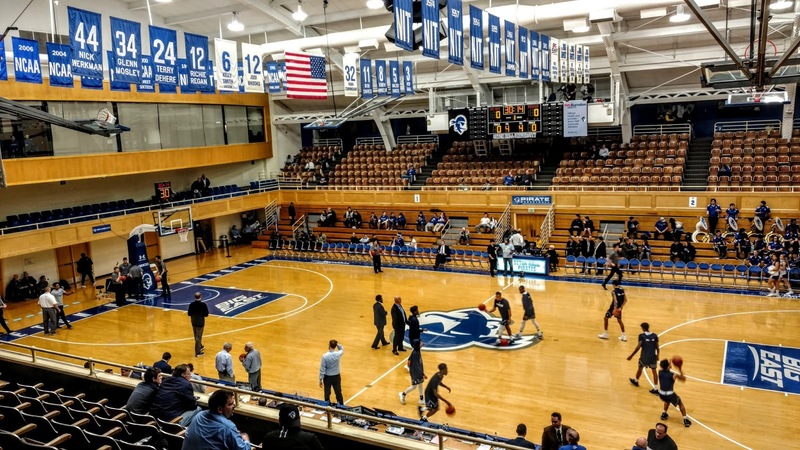 Check out Seton Hall's 2018-19 schedule when it is released next summer and mark your calendar for the Walsh Gymnasium game, you won't regret it. Seton Hall came in ranked 15th in the nation, their highest since 2001, while Saint Peter's was 269th of 351 teams in the RPI, having returned only a single player from their CIT championship squad. So a blowout was anticipated and that is exactly what happened. The Pirates scored the first 8 points and had a 21-6 lead midway through the first half before the Peacocks started to sink a few to enter halftime down 42-23. 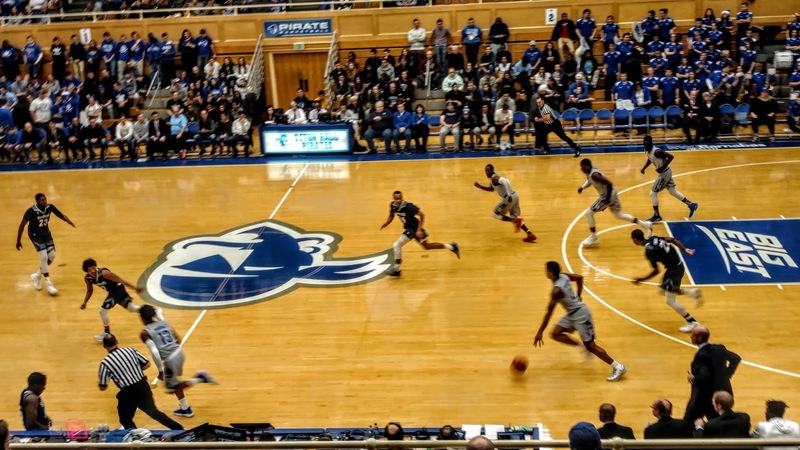 Seton Hall scored the first four points of the second half and from there, Saint Peter's played them evenly as the 23-point difference held to the end, with Seton Hall winning 84-61 in a game whose outcome was never in doubt. Angel Delgado, last year's top rebounder in the nation, was the star with 18 points and 11 boards, his 57th career double-double, which leads Division I hoops. This was venue #767 lifetime. 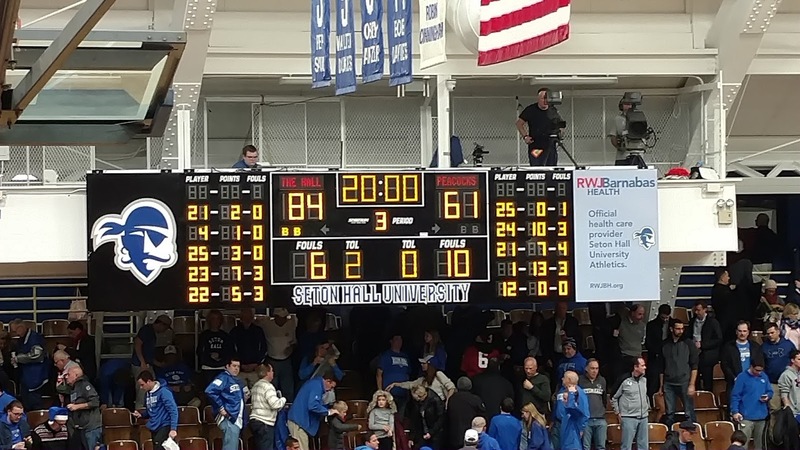 Seton Hall took their #15 ranking to Rutgers for their next game and were upset by the Scarlet Knights.